Dmitry at his sound scanner workshop. ::vtol:: is the alias of Moscow-based media artist and musician Dmitry Morozov who implements his ideas in technological art. He also develops and creates experimental musical instruments and modular synthesizers. He regularly holds workshops and lectures dedicated to technological practices in art. Dmitry is a guest at iii and I interviewed him at his residency studio in the DCR-building in The Hague. How did you come across iii? I know Mariska, she introduced me to Matteo so that’s how i ended up here. I’ve gotten to know a bunch of people. It’s kind of a community.. without borders. And it’s my first residency in the Netherlands, I like it here, it’s a beautiful country. I’m mostly building sound objects, some of them could be sound installations, or instruments or interactive objects. The only main thing is that it’s moving, it’s about division. Audiovisual work, combination of sound, light and movement. And I really like fun and playfulness. 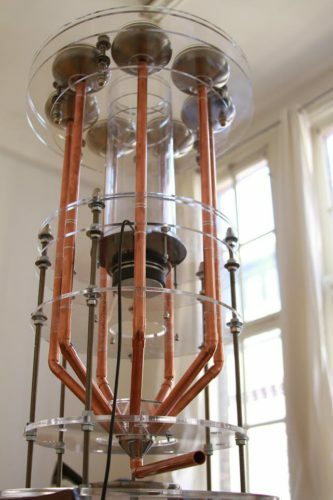 "This work is a copper pipe machine that makes balls jump. It's funny and it's hard to take it seriously." Were you a ‘geeky’ kid? In my childhood I wanted to know how things work and would dissemble and assemble anything. In my teenage years I was interested in music. And later on I realised that there was electronic music. All these passions came together at some point. At the beginning I wasn’t an artist at all. I was just building synthesizers and crazy machines to use them as instruments. DM: yeah or looking at paintings. Technology is a really nice language, for me, to speak with the audience. What defines the border between music and fine art? DM: Actually there is no border. DM: You could say I moved from music as a composer, or a musician and artist who is performing, to a guy who builds tools and machines that perform instead of me… a kind of.. substituting me. You’re eliminating yourself as a performer? Yeah, but I still perform though. And I like to build instruments that are crazy, strange or interesting to perform with, which is also a very big part of my activities. But for me music and art are completely different. In a music performance, music or sound is the main point (the performing) but in art a performance could produce sound, but also movement, light etc. Sound isn’t the main goal. Also in music, even if it’s a noise piece with all sorts of sounds.. bleeps.. there’s always a structure and structure means time. But in an artistic performance it’s possible that there is no structure, no time frame… or no time (maybe a loop or infinite, it’s not defined). Is that one of the reasons you wanted to act in fine arts? No, I just really wanted to build my machines. I am really fascinated by creating sound- and moving objects. First I was doing more interactive installations and my instruments were more DIY. I was not into producing fancy or ‘well-designed’ – “I don’t want to say that now my objects are so well designed”- good looking things. Of course the esthetics were important to me but I was mainly focused on how the machines acted and interacted with the audience and not on their esthetics. Quite crazy things, that (points at his objects behind us) for instance looks more like a jet engine than an artpiece. You need like a form, proportions, if you feel the space and organize the space right, then it’s good and it doesn’t matter which parts you take. I like the combination of copper and steel, transparent glass or, now, also things I found at Ikea. There will be more electronics and wires in this object so it will look less like a piece of furniture. Im not done yet..There will also be water, lights and.. maybe both, upstairs, downstairs…..
Dmitry is analysing his work and moves a bit, gets up and moves along his work that is balancing on two chairs. You can see he wants to continue welding because it's too neat now..
Do you want the audience to see how your objects work? YES I do! I am really.. you know.. always into machines that are really clear how they act. These are also esthetics that I use a lot. For example if I was a sculptor and had to make a human figure.. first of all I will make them without their skin, I will show what’s inside. I really think that all kinds of this ‘technological art’ is very human oriented. Everything what we build in our world, it’s all like part of us. If you know Marshall McLuhan.. his philosophy of media, all tools are just extensions of our bodies. The god created us as his copy and it’s the same with objects/tools, we build them the way we are..
For me, my works… they have their own psychic, their own soul, they are my kids. My works could have secrets, they could act wrong, could do weird things… They have the same problems as we do.. or show the same behaviour or specific habits..
People are talking to their devices/machines, not like Siri or Google, but, for example, if the car doesn’t start, people shout at it or say nice words (come on…please start).. For me it’s very important if machines start to work, wrong or not, it shows that they are human, they are alive. Because it’s part of you, it’s your creature, it’s alive. "For me, my works... they have their own psychic, their own soul, they are my kids. My works could have secrets, they could act wrong, could do weird things..."
At what moment do you decide that your creature is alive? For me it’s alive when it acts without my help. It’s a piece of me but it has to function on its own. That can be a malfunction, that’s OK, because that’s human. It doesn’t have to be perfect. I’m very strict but at the same time I am very flexible, and I think it’s a nice balance. The goal is to create a work. And how, that’s always different. Here in the Hague I can work without distraction and very concentrated, but at the same time I don’t have all the tools that I have in my workplace in Moscow so I work with what I find. I borrowed a screwdriver next door and I dissembled objects at IKEA, in the shop…That was actually quite funny.. a security guard was looking at me like “What are you doing?”. But.. Look at these (points at metal bowls), these are actually like.. what do you call them.. to contain your toilet brush. But it’s a beautiful form so I dissembled them and now they function as metalbowls in my piece. And I use tiny little metal balls (he points at bracelets laying on his desk) so those speakers can produce soundwaves that will make the metal balls fly through the room. Or maybe I contain the metal balls in a coil on top.. I don’t know yet. It’s a kind of trial and error process and I’m constantly exploring the possibilities. I’m not a perfectionist, but I’m also – at the moment – not satisfied with the outcome yet. Again..you’re strict but also very flexible ;)?